Eric Garner, 43, died after being put in an apparent chokehold by police while being arrested for the sale of untaxed cigarettes on Staten Island. 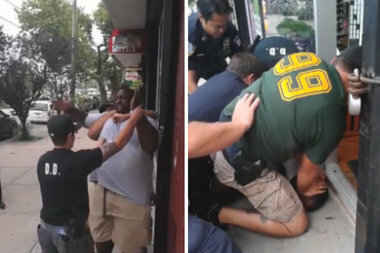 STATEN ISLAND — Eric Garner’s death after being put in a chokehold by an NYPD officer was ruled a homicide Friday by the New York City Office of the Chief Medical Examiner. The 43-year-old Staten Island father of six died July 18 after Officer Daniel Pantaleo appeared in a video to use an illegal chokehold while arresting him for allegedly selling untaxed cigarettes or "loosies" on the street. The incident was captured on video. Garner was killed by compression of his neck and compression of his chest while police physically restrained him, the Medical Examiner’s Office said. The father also suffered from chronic asthma, obesity and hypertensive cardiovascular disease, which contributed to the death, the Medical Examiner’s Office added. Garner could be heard repeatedly yelling, "I can't breathe" in the video of his arrest. Pantaleo, who appeared to choke Garner in the video taken by a witness, was placed on modified duty after the death. A separate video of the incident posted to YouTube shows officers standing around a motionless Garner for several minutes while waiting for medics to arrive. Several EMTs eventually arrive and take several more minutes to put him on a stretcher without giving him any medical aid, the video shows. “We await the issuance of the official death certificate and the autopsy report. The investigation into Mr. Garner’s death continues,” Staten Island District Attorney Daniel Donovan said through a spokesman. The NYPD launched an internal investigation and the U.S. Department of Justice is monitoring the case. 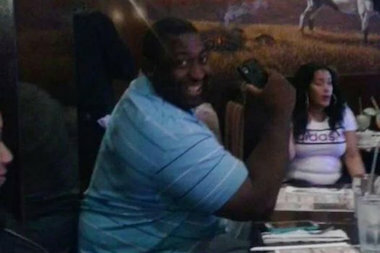 Garner's family met with federal prosecutors last Friday to demand they start a civil rights investigation in his death. “On behalf of all New Yorkers, I extend my deepest sympathies to the family of Eric Garner, on this day we have received the Medical Examiner’s findings concerning the cause of his death," Mayor Bill de Blasio said. "My administration will continue to work with all involved authorities, including the Richmond County District Attorney, to ensure a fair and justified outcome." The police union extended condolences to the Staten Island man's family, but put the blame for his death on his health problems and his refusal to comply with police orders. No answered the door at Pantaleo's Great Kills home Friday afternoon and he could not be reached for comment. In a similar 1994 incident, Anthony Ramon Baez, 29, died after a police officer put him in in a chokehold after a dispute over a touch football game. Former officer Francis X. Livoti was cleared of criminal charges in a state court, but later convicted in federal court of violating Baez's civil rights. Livoti was sentenced to seven and half years, but served four years in prison, The New York Times reported in 1998. Police Commissioner Bill Bratton said after Garner's death that the NYPD would do a "top to bottom" review of they train officers to make arrests. Garner's family declined to comment at their home in West Brighton. Rev. Al Sharpton planned to rally with the family on Saturday at 9:50 a.m. at the National Action Network's headquarters at West 145th Street and Lenox Avenue.